What Does a Dog Show Handler Do? Dog show handlers are well versed in the arts of showmanship and presentation. They are generally self-employed independent contractors who travel the country as they seek championship honors for their clients' dogs. Some handlers specialize in conformation classes for a specific breed. Others work with several breeds that represent a particular group, such as terriers, sporting dogs, working dogs, and toy dogs. They may also specialize in obedience or agility trial handling. 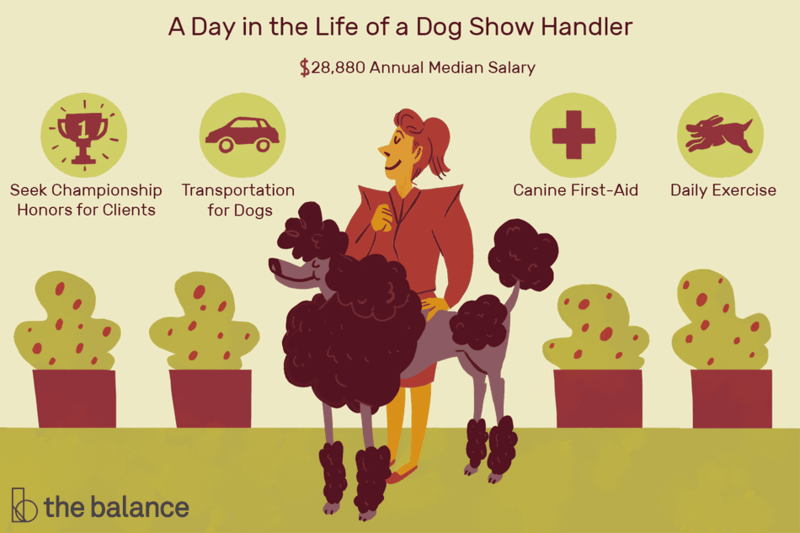 Serious dog owners pay a professional handler to get the best performance from their show dog. Handlers typically have a number of clients, traveling to shows most weekends with their dogs. Presenting their canine charges to their best advantage during competition. To accomplish this goal, the handler must know the detailed protocols for the breeds that they show. Varied paces and poses may be required. An experienced dog show handler may be familiar with particular judges and what they look for, which can be an advantage. Arranging transportation for the dogs' daily exercise and conditioning, obedience training, and grooming. Dog show handlers often provide routine care for the dog for extended periods during its career; some dogs spend several years in the primary care of their handler. Communicating and relating well with others. To be successful in this role, you must be able to interact well with others, such as clients and their dogs, breeders, competitors, and judges. Dressing the part during competition. A dog show handler must dress professionally, as appearance helps to ensure the best possible outcome. Working with veterinarians. To keep dogs healthy, handlers must make sure all their dogs' medical and dietary needs are met. While the U.S. Bureau of Labor Statistics (BLS) does not provide a dog show handler classification, they do have one for animal trainers, who must perform some of the same functions as dog show handlers, as both may need to prepare animals for shows or competitions. A handler generally charges between $50 and $100 per class, per dog. Additional fees may be earned for grooming services, boarding, and travel costs. There also may be a bonus structure for wins at various levels, such as best of breed and best in show. Dog show handlers must also factor in additional costs such as travel expenses, having client/handler contracts drafted, and maintaining insurance policies. Many professional handlers invest in a large trailer or recreational vehicle if they tend to have multiple dogs with them at each show. These vehicles are equipped with travel crates on the interior and portable runs that can be set up upon arrival at the destination. Dog show handlers are not required to have formal training or licensing, but many learn the requisite skills from an apprenticeship with an experienced handler. There are also “junior” classes for young handlers, and many of these juniors go on to compete in the show arena as adults. Dog shows offer an opportunity to network with owners, breeders, and handlers, especially if you are looking for an apprenticeship. Useful prior experience for those entering the field includes work as a dog trainer, dog groomer, or animal behaviorist. There are many professional organizations for dog handlers, but two of the most prestigious membership groups are the American Kennel Club (AKC) Registered Handlers Program (RHP) and the Professional Handlers Association (PHA). The AKC RHP recognizes professionals who have high standards regarding dog care and business ethics. RHP handlers must have at least seven years of experience and sign a code of ethics. They also offer an apprenticeship program, which allows every year completed as an apprentice to count at an accelerated rate toward their years of experience qualification for full membership; that is, one year in the apprenticeship counts as two. PHA members must have 10 years of active involvement with show dogs, including five years as a professional handler. They offer a highly regarded apprentice program that lasts for at least four years. Apprentices work under the supervision of their PHA sponsor or employer during their training period. The dog show industry is a healthy one, as purebred dogs from top lines are always in demand for breeding purposes. While it may take a significant investment of time and funds to become an established handler, there is a very positive outlook for this profession. According to the U.S. Bureau of Labor Statistics, the industry is expected to continue to grow 11% to 2026. A main reason for this increase is the need to replace workers who have left the profession. A lot of time is spent outdoors, sometimes working in unfavorable weather conditions. This is important to ensure that dogs receive the necessary physical activity to stay fit. Also, dog show handlers must travel to shows often out of town or out of state. Dog show handlers must maintain an intense schedule of travel and competition. A handler usually spends most weekends at shows. Handlers have to start very early in the morning to get the dogs ready to compete, as grooming and preparation can take several hours. SimplyHired advertises dog handler jobs. Also, if you are just starting out in this field, Indeed and Glassdoor provide job postings for dog handlers as well as dog trainer assistants. In addition, these sites offer other resources such as resume and cover letter writing tips, as well as interviewing techniques. Look for dog training opportunities in your area, such as a local dog shelter or organization such as the Centre County PAWS. The Animal Humane Society also offers volunteer opportunities working with dogs. Get guidance by working closely with an experienced dog show trainer. Other opportunities for handlers include leading training seminars for aspiring handlers, working with young show dogs, judging classes at shows, or offering boarding kennel services.